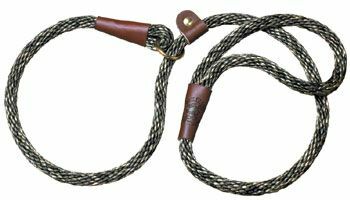 The Mendota British Style Slip lead is a popular lead for agility trials. The lead slips easily over the dogs head and is soft in your hands. The combination leash & slip collar in one, tightens when pulled and loosens when released. Made from waterproof solid braid polypropylene rope, with a brass 'O' ring, loop handle with leather accent and leather stop, which can be set (by you) to limit the amount that the loop can open and help prevent your dog from backing out. The large lead is approx 13mm thick and 1.2m long. The small lead is approx 10mm thick and 1.2m long. Available in assorted colours as displayed. NB: Confetti colours only available in Large.